Have you ever made a project that you thought you’d love, but when you got it finished, it just wasn’t anything you wanted anymore? These days, when I’m knitting for myself, I try really hard to make things I think I’ll wear. That seems obvious, doesn’t it? So why, if I’m not a vest person, do I have three vests that I’ve made, but never worn? It boggles my mind, for sure. One vest has been reclaimed for yarn for my Merle Sweater. Another one has been put in the yard sale pile. (It’s not worth it to me to reclaim that yarn.) The third is one is waiting for a project to come along that will be perfect for the yarn. There’s also a shawl or two that I don’t really care for. These projects all took time and effort to make, but they’re just sitting, not being used. I’ve gifted projects that I don’t like for myself to people who I think might like them. 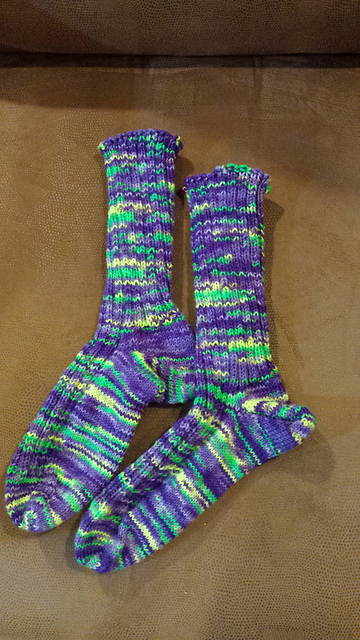 These purple socks went to my mom as soon as I finished them. I expected the yarn to knit up as purple with just hints of the bright colors, but it turned out way too bright for me. She loved them (and they did happen to match the shirt she was wearing that day.) We’re both lucky we have the same size foot! I bought a whole bunch of sport-weight yarn for that, cast on a million stitches (actually, I think it was only 300-something, but still) and actually made two sections like the above, then joined them with a cable down the middle. The trouble is with that lace part you see right there. I just can’t get past the phallic-ness of it. It’s sitting in a bag, and the ends haven’t even been woven in. It’s been sitting like that for almost 3 years. It’s obvious I am not going to wear it, so I think it’s time to frog so I can use the yarn for something else. My project page says I used 4 skeins for a total of 580 yards. I’m not sure if that’s what I used in the entire thing or if that’s just what I bought initially. I know I went back and bought more yarn after I decided to do something different than the pattern called for. I know I have at least that much, though, so I can work from there. So, off to the frog-pond it goes. Slippery bamboo cuff of a shrug-thing. That’s the start of an Evening Shrug in Berroco Bonsai yarn. The yarn is Bamboo and nylon and it is so slippery! It’s very shiny, but it’s very hard to work with. It makes knitting a cuss-fest. I couldn’t even get it to stay in a center-pull ball. I don’t even know what I could stand to make with it. I think this yarn is going to the for-sale pile. 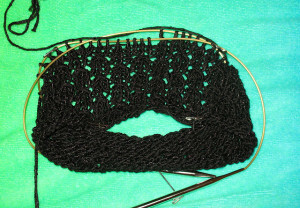 When I first started knitting, I picked up my knit stitches the wrong way. This made all my knit stitches twisted. 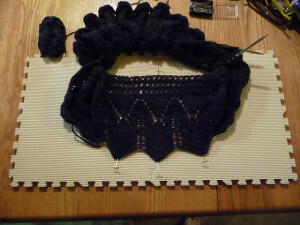 I purled correctly, but the knitting was just wrong. I discovered this when I was taking a class learning to knit socks. 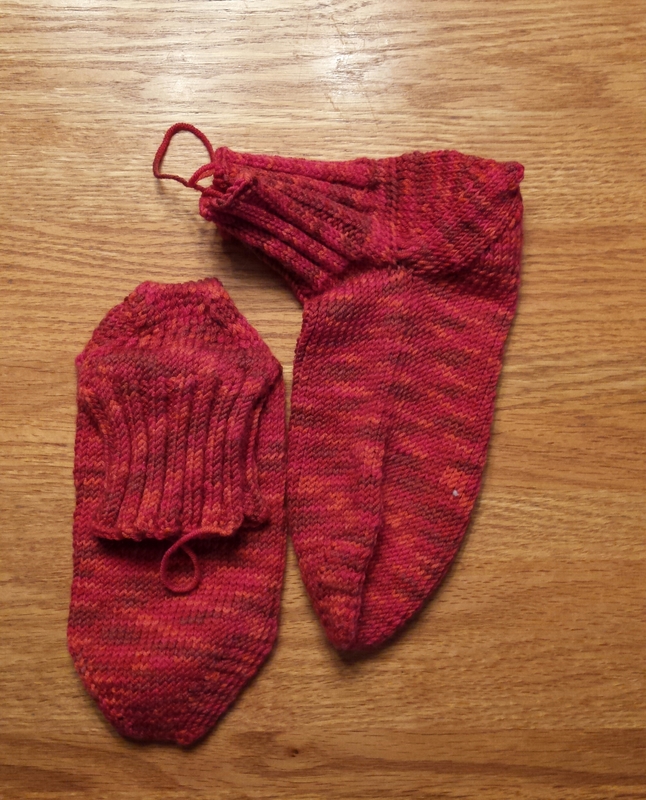 I was probably halfway through with the pair, and I decided to just finish them out the wrong way then figure out how to knit right. This was 5 years ago, and I’ve never worn the socks. I never even wove in the ends. They’ve been sitting, unused and unloved for that long. When the first snow of the year hit, I realized Jellybean didn’t have mittens that fit. He has a mismatched pair, but they’re too small. I offered to make him more. I dug through my stash and found a really great superwash yarn in yellow. 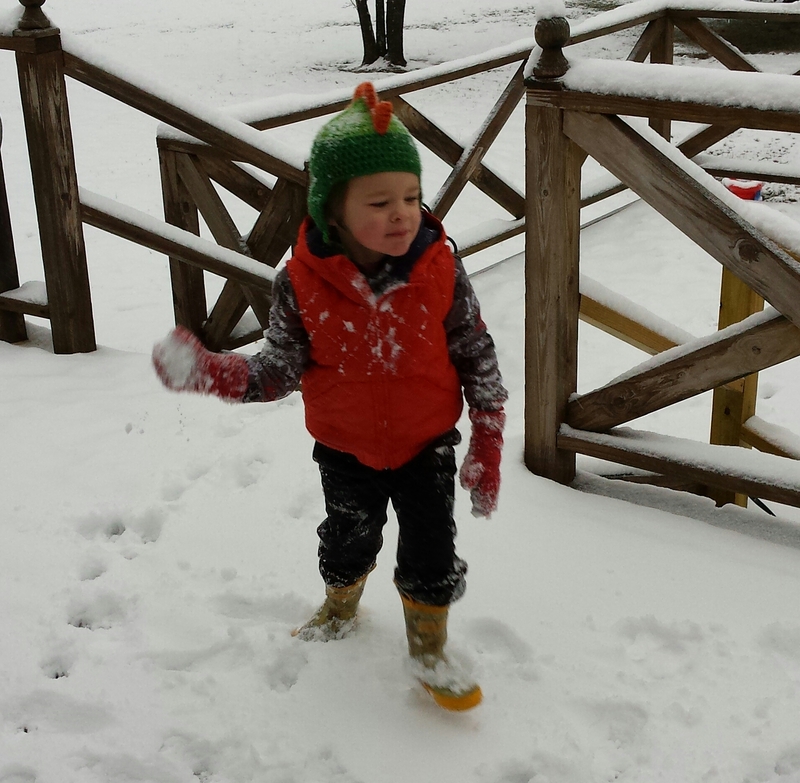 “What about yellow mittens?” I asked him. And I came across the first socks. They were knit with Crystal Palace Yarns Merino 5 Print. Red with hints of orange, yellow and magenta. Worsted weight, so they’ll knit up fast. Superwash for easy care. Perfect! 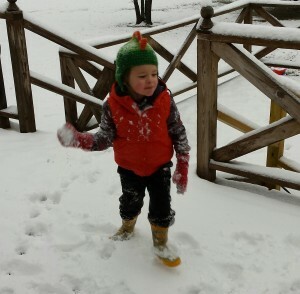 I had no reservations about ripping out the socks to make mittens. I wasn’t going to wear the socks, so I’m happy the yarn gets some good use. I used Dulaan Easy-On Mittens for the pattern. They took an afternoon to knit and as you can see, they’re great for snowball fights with daddy. The sweater I made for my husband is also being reclaimed to make him a sweater that actually fits. Yarn can also be reclaimed from thrift store sweaters! It’s fun to find a beautiful cashmere sweater for $5, then rip it out to make something new. It may seem frustrating to make something, then just rip out all that work. However, I would rather rip out a project to make something useful than to just let it sit there, not being used at all. Have you ever undone a project to make something new?